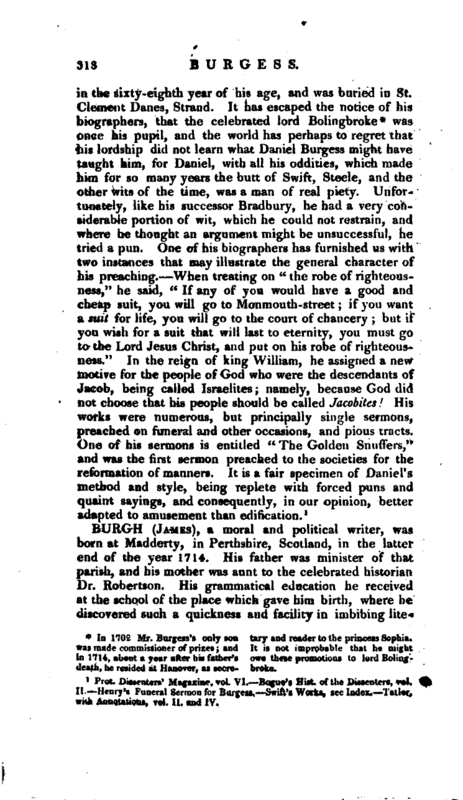 , a dissenting divine of the seventeenth and eighteenth centuries, a wit himself, and “the cause of wit in other men,” particularly dean Swift and his contemporaries, was born in 1645 at Staines in Middlesex, where his father then was minister, but was afterwards, at the restoration, ejected for nonconformity from the living of Collingbourne Ducis, in Wiltshire. Daniel was educated at Westminster school, and in 1660 went to Magdalen-hall, Oxford, but having some scruples of the nonconformist stamp, he left the university without a | degree. It would appear, however, that he had taken orders, as we are told that immediately after he was invited to be chaplain to a gentleman of Chute in Wiltshire, and afterwards to a Mr. Smith of Tedworth, where he was tutor to that gentleman’s son. In 1667, the earl of Orrery, lord president of Munster, took Mr. Burgess over to Ireland, and appointed him master of a school which he had established at Charleville for the purpose of strengthening the protestant interest in that kingdom, and Mr. Burgess, while here, superintended the education of the sons of some of the Irish nobility and gentry. After leaving this school, he was chaplain to lady Mervin, near Dublin; but about this time, we are told, he was ordained in Dublin as a presbyterian minister, and married a Mrs. Briscoe in that city, by whom he had a son and two daughters. 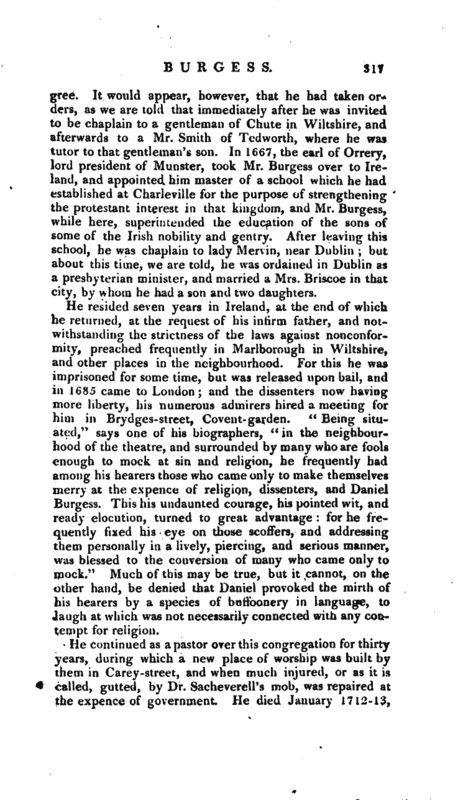 He resided seven years in Ireland, at the end of which he returned, at the request of his infirm father, and notwithstanding the strictness of the laws against nonconformity, preached frequently in Marlborough in Wiltshire, and other places in the neighbourhood. For this he was imprisoned for some time, but was released upon bail, and in 1685 came to London; and the dissenters now having more liberty, his numerous admirers hired a meeting for him in Brydges-street, Covent-garden. 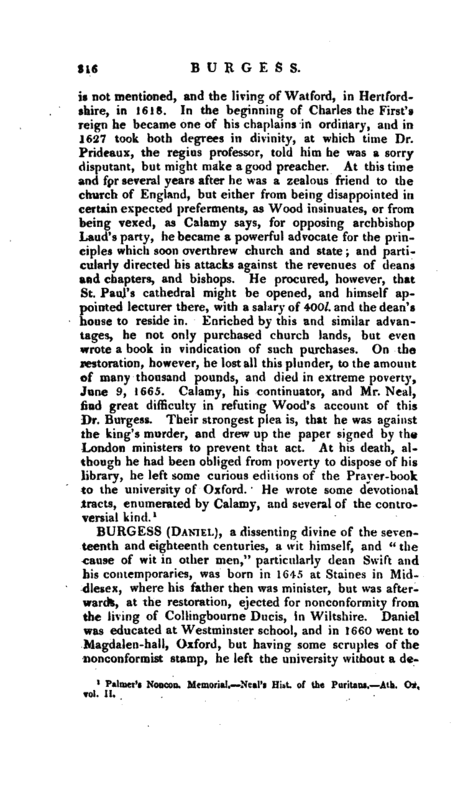 “Being situated,” says one of his biographers, “in the neighbourhood of the theatre, and surrounded by many who are fools* enough to mock at sin and religion, he frequently had among his hearers those who came only to make themselvesmerry at the ex pence of religion, dissenters, and Daniel Burgess. This his undaunted courage, his pointed wit, and ready elocution, turned to great advantage: for he frequently fixed his eye on those scoffers, and addressing them personally in a lively, piercing, and serious manner, was blessed to the conversion of many who came only to mock.” Much of this may be true, but it cannot, on the other hand, be denied that Daniel provoked the mirth of his hearers by a species of buffoonery in language, to laugh at which was not necessarily connected with any contempt for religion. In 1702 Mr. Burgess’s only son was made commissioner of prizes; and in 1714, about a year after his father’s death, he resided at Hanover, as secre­ tary and reader to the princess Sophia, It is not improbable that he might owe these promotions to lord Bolingbroke.